Free jazz power trio Uuskyla Øgrim & Berg recorded live at Kafé Hærverk, with special guest Harri Sjöström on one track! LP pressed on 180 black vinyl. Limited edition of 200 copies. Includes download card. ORDER VIA BANDCAMP or buy your copy at Kafé Hærverk! Free jazz power trio Uuskyla Øgrim & Berg’s music is an oblique and deconstructed but red-hot mix of jazz, rock, and several other styles in between. It’s taut and metallic, sprung, flexed and sinuous, hitting hard on the recoil. This trio shows how much the Scandinavian scene remains vibrant and with names that deserve to be more recognized worldwide. 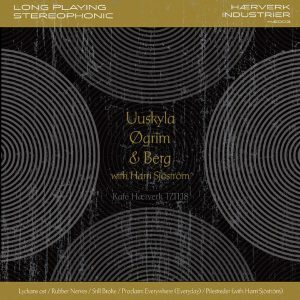 Uuskyla Øgrim & Berg have previously self-released the albums Ulrr (2017), LAIV (2017), and Oslo Hærverk (2018), which is a recording of their first show at Kafé Hærverk on 26 April 2018. Their second performance at Kafé Hærverk on 17 November 2018 has now been made into this new album, featuring the opening act that night, saxophonist Harri Sjöström, on the incredible encore included as the last track.